On Windows® 10 you only need to install the Wi-Fi driver instead of the full Intel® PROSet/Wireless Software package. Starting with release version 20.120, a driver-only installation package is provided on Download Center. However, your system manufacturer may have pre-installed the Intel® PROSet/Wireless Software on your system to enable OEM-specific features. You should get the latest OEM-specific Intel® PROSet/Wireless Software from your computer manufacturer's support. The Intel® PROSet/Wireless Software or Intel® PROSet/Wireless WiFi Software is the name of the package that includes the Wi-Fi drivers and some other software components for Intel Wireless Adapters on Windows 7/8.1*. The Intel® PROSet/Wireless Software package includes Wi-Fi drivers for different Intel® Wireless Adapters supported by this package. The Wi-Fi driver version you install to your system may be different than the Intel PROSet/Wireless Software package version containing this driver. For example, in Intel PROSet/Wireless Software 19.50.1, the Wi-Fi driver version for Intel® Dual Band Wireless-AC 7260 is 18.33.6.2. See Understanding the Intel® PROSet/Wireless Software Version and the Driver Version for further details. 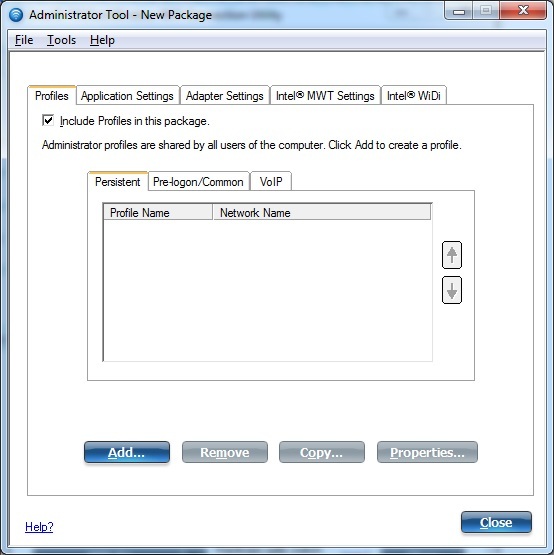 IT Administrators can use this tool to create custom network profile packages. They can export the packages to client systems running Microsoft Windows*. Not installed by default and Windows® 10 doesn't support the utility. WPS Connection Tool: Lets you connect to a wireless access point using Wi-Fi Protected Setup (WPS). Windows 10 doesn't support this tool. The Windows operating system now natively supports the functionality. Intel® Wireless Troubleshooter: This tool helps resolve basic issues with wireless network connections. Windows 10 doesn't support this tool. Newer versions of Windows have built-in diagnostics capabilities. Wireless Event Viewer: Tracks, displays, and logs wireless events in files that you can send to customer support. Manual Diagnostics Tool: Allows you to run a basic set of diagnostics that verify the functionality of your Wi-Fi adapter. Intel Advanced Statistics: Shows information on the Wi-Fi connection to the wireless access point. Application Programmable Interface (API) set for system manufacturer to create applications that interacts with the Wi-Fi adapter and platform. Support for features like the Cisco Compatible eXtensions* (CCX) may be available for your computer. 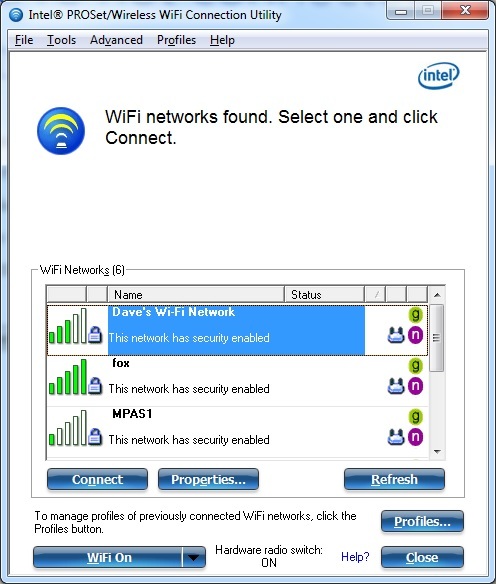 Note CCX has been removed from the Intel® PROSet/Wireless WiFi Software 20.90 and later. 1 These features aren't installed by default. To install, see how to do a customized installation of Intel®​ PROSet Wireless Software.